BigMLer is a free and open source tool that will help you perform sophisticated Machine Learning workflows by typing just one line in your command prompt. Simple and effective, BigMLer can satisfy requirements for hands-on development and also for perfectionist model tuning. 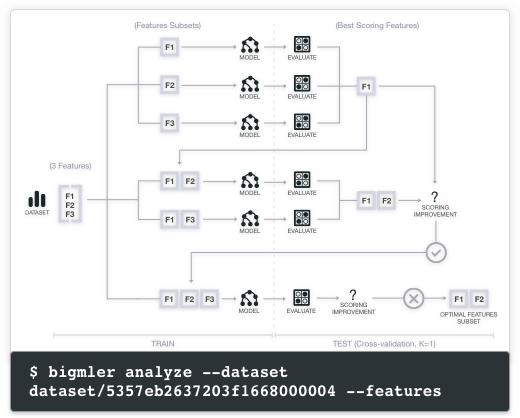 Create and configure any of your BigML models, evaluations and predictions with BigMLer. Fine-grained options bring you all BigML capabilities to manage your resources. BigMLer allows you to automate complex workflows. Enhance your models' performance by using cross-validation or automatically selecting the features that optimize your model. All this in a single line of code! BigMLer can easily create your models in the Cloud and bring them to your laptop to be used later. Once your predictive model is available on your preferred environment, you can start making lightning fast predictions at no cost! You can add the following lines to your .bashrc or .bash_profile to set those variables automatically when you log in. 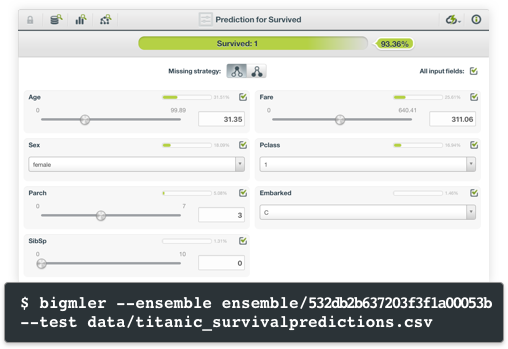 It will return a prediction for each instance contained in the dataset "predictions.csv". In the above example BigMler will build 10 different models constructed with different 90% subsets of the data and evaluating each of them against the rest 10% of the instances. 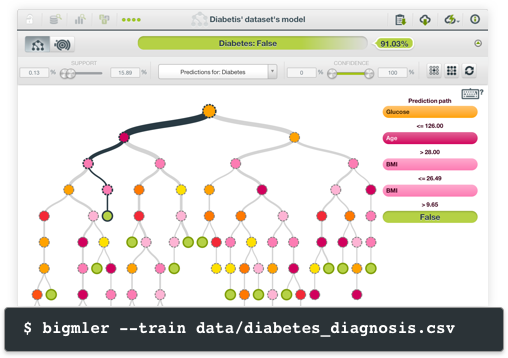 This command will iteratively create models based on subsets of features in order to select the ones that score best.